On the occasion of the 50th year anniversary of Stonewall, Life Ball will be held during EuroPride. Life Ball, organized by the association LIFE+, celebrated its 25th anniversary in 2018. The event was founded by Gery Keszler and Torgom Petrosian in 1993 and takes place at Vienna’s City Hall every year since. Life Ball has become one of the world’s most important AIDS charity events. The seven-digit proceeds of the event benefit global aid projects, that are being donated every year in collaboration with international partner organizations. An unsurpassed number of international celebrities from high fashion, entertainment and politics are supporting the event tirelessly every year to raise awareness for the cause. 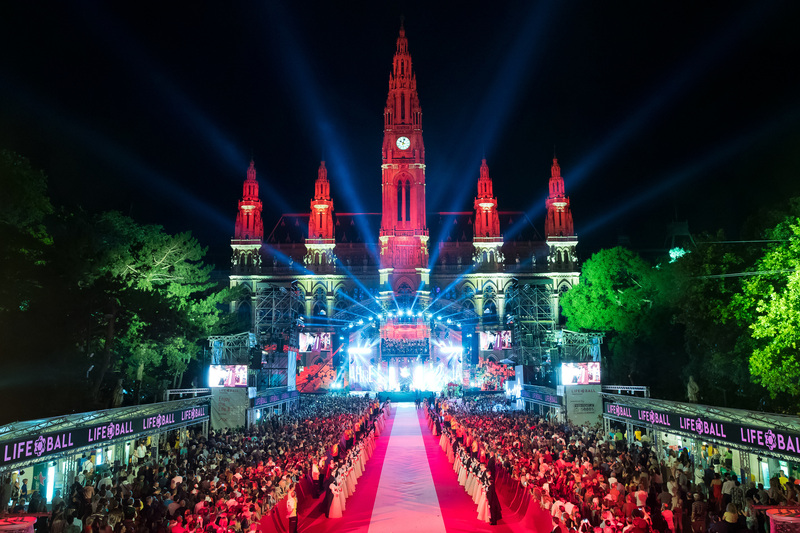 The City of Vienna also contributes significantly to the success of Life Ball. Providing Vienna’s City Hall as venue for this event clearly shows this city’s cosmopolitanism, tolerance, and social responsibility. The message is loud and clear: Together we can end AIDS! A year-round awareness campaign ensures that the dangers of HIV and AIDS remain in the public eye even after the ball. National and international stars had their picture taken with the LIFE+ patch and encouraged others to get tested for HIV as well. The goal of our KNOW YOUR STATUS campaign is to prevent HIV infections or detect them early on. The campaign will be extended in 2019. It is of central importance for Life Ball to increase the diversity of society and to make it visible as a strength of it, as well as to enhance tolerance for varied ways of life and love. Flamboyant outfits and creative stylings under the sign of the Red Ribbon and solidarity make an important visual statement for this, which is spread all over the world via the media and makes the Life Ball a unique event. LIFE+ considers itself responsible to continuously promotes awareness and public consciousness about the AIDS epidemic. Through Life Ball and our additional, yearly activities, LIFE+ works to raise funds to help those impacted by and living with HIV/AIDS and reduce stigma and discrimination. The Life Ball works with great business partners year after year. Only their generous support in the form of monetary and material donations makes this great event possible. LEARN MORE ABOUT THE CUSTSOMIZED COOPERATION POSSIBILITIES.